The EL5224 EL5324 and EL5424 feature 8, 10, and 12 low power Buffers respectively, and one high power output Amplifier They are designed primarily for buffering column driver reference voltages in TFT-LCD applications as well as generation of the VCOM supply. Each low power Buffer features a -3dB bandwidth of 12MHz and features Rail-to-Rail input/output capability. The high power Buffer CAN drive 100mA and swings to within 2V of each rail. The 8-channel EL5224 is available in 24-pin QFN and 24-pin HTSSOP packages, the 10-channel EL5324 is available in 32-pin QFN and 28-pin HTSSOP packages, and the 12-channel EL5424 is available in the 32-pin QFN package. They are specified for operation over the full -40C to +85C temperature range. 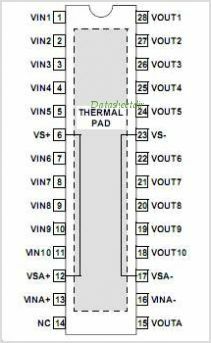 This is one package pinout of EL5324,If you need more pinouts please download EL5324's pdf datasheet. EL5324 circuits will be updated soon..., now you can download the pdf datasheet to check the circuits!